There are two common symbols for zen enso. One is a brushstroke of a closed circle. The closed circle represents the totality of experience and life. The other is a brushstroke of a circle with one small opening. The open circle represents the imperfection found in all things and suggests to the student to stop striving for perfection and instead to allow the universe to be as it is. The open circle is a concept that reflects closely with Japanese Zen Buddhism. The Japanese concept of wabi-sabi is that all things are perfect as they are. An analogy is a peasant’s jar, misshapen, chipped and worn through years of daily use. Although it may not be as pleasing visually as a pristine carefully crafted jar, it is said to stimulate the mind and emotions, stimulate the spirit of a person to contemplate the essence of reality. As with everything related to Zen, there is a beautiful simplicity to the traditional enso, both the open and closed versions. The classic symbol for Zen is the enso. It is known as the circle of enlightenment. In the sixth century, a text named the Shinhinmei refers to the way of Zen as a circle of vast space, lacking nothing, and nothing in excess. At first glance, the ancient enso zen symbol appears to be nothing more than a circle. But it’s symbolism refers to the beginning and end of all things, the circle of life, & the connectedness of existence. It is said that in the hands of a Zen master. The power of the enso symbol for zen is released. Helping those who meditate upon it to reach a higher level of consciousness. It is used as a symbol of enlightenment. Zen masters often brush paint an enso for their student to meditate upon. The quality of the brushwork is said to reveal the depth of the master’s enlightenment. are widely preferred by tattoo lovers all around the world. Popular amongst both, men & women, lotus design is not only revered for its beauty, but also reflects a deeper spiritual meaning. The flower grows in muddy water, yet symbolizes purity and harmony. As a tattoo design too, lotus stands for the same attributes in human nature & depicts the thoughts and attitude of the bearer. Lotus flower is amongst the most amazing creations of nature and its beauty lies in its purity. The aesthetic brilliance of this wonderful flower has made it one of the most popular objects used in tattoo designs. Tattoo art has used natural objects such as dreamcatchers, feathers, anchors, flowers to make attractive depiction on human body. 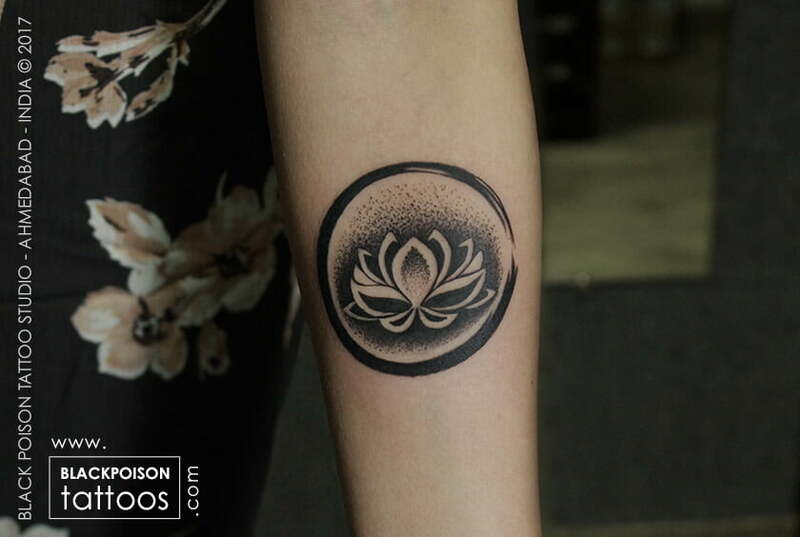 Lotus flower finds a great degree of usage in traditional as well as contemporary tattoo art. This attractive and eye catching lotus flower tattoo designs are a hot favorite among tattoo lovers. In the East as well as the West, and is featured in diverse sizes and colors & on various parts of the body. Giving an elegant look to the tattoo bearer. The lotus flower not only looks beautiful when used in tattoo art, but also has a deeper meaning, as explained in various cultures & religions across the world. It can be combined with certain images to convey the personal beliefs of the wearer & can be much more than a style statement for him. Chinese tattoo art includes some inspirational characters along with the lotus, while Buddhists. May have the image of the Buddha added to it, in order to represent enlightenment. It is not only the design in lotus tattoos which is of great significance. But also the color chosen by the wearer matters a lot. As far as the appearance and symbolism of the tattoo is concerned. As said before, red, which is the color of passion, reflects deep devotion in the divine, when used in lotus tattoo design, while gold teamed with white lotus signifies the purity of the soul.